And we're back! With 5 episodes of series 19 being released in October, and The Great Race released today (review coming soon), Channel 5 has started to air series 20 in the UK! And we start with Sidney Sings, an episode that sounds interesting. But will it deliver? The short answer is... yes, surprisingly! I expected this to be rather mediocre. I expected a character similar to Dory from Finding Nemo/Dory that would be charming after a while, but get stale very quickly (that's honestly why I haven't been interested in seeing Finding Dory in cinemas). But Sidney just has so much charm that you just can't hate him or this episode. His technique to help him remember his job was also really nice, and having Thomas teach him that worked really well. 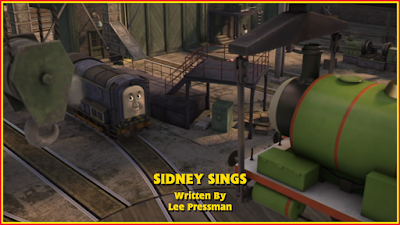 Having him join the story where Percy derailed did feel a bit forced, but it's one of those things that you end up not caring about as he's handled really well, and his role overall was a lot more natural than, for example, The Great Race (spoilers for that review). Also, this is one of those childlike conflicts that actually works for any age group. Forgetfulness is something that we can all sympathise with, and putting what you're trying to remember in either a song or a rhyme are common solutions. And even if you forget that, it could be one little thing that springs up randomly that helps you remember what you were originally going to do. In that regard, it's a definite stand out, especially when compared to the likes of Steamie Stafford and Henry Spots Trouble. A nice little character also came when Annie and Clarabel said they liked songs. Not only is that a fun little nod to the fact that they're voiced by someone who's in a band, but it's a nice little callback to series 1. The thing I liked most about this part though is that it wasn't disruptive. Older fans can see it as a callback, while younger ones (the actual target audience) can just see it as another little trait to add to their characters. It was really well done. As was the flashback to The Missing Christmas Decorations. Hearing Nigel Pilkington reprise lines originally done by Keith Wickham felt weird at first, but I honestly think Nigel performed that little bit slightly better than Keith did. That could be because Nigel's voice sounds more natural while Keith's was a bit too squeaky at times. It was rather nice to see Whiff get a role, too. Although, it seems like Keith Wickham is out of practice voicing the character as, like Ben Small did with Toby in Signals Crossed, he seemed to lose quite a bit of the uniqueness his voice once had. The red bogie coaches made a surprise return as well. I won't go into detail here about what I think of them as I've talked enough in the upcoming Great Race review. But for now, I'll just say they have the exact same problem as any other bogie coach: too tall and too thin. Chris Renshaw has taken over as composer for the show, and I really like what I've heard so far. Sure, it's sad to see the Hartshornes go, but I think they've picked a very good composer to take his place. Sidney Sings was really 100% okay. Nothing great, nothing worth getting upset about, but just okay. It felt pretty slow to me. 6/10 from me. Sidney Sings? Who the hell is Sidney? I forget. What was the Mayor doing with Sir Robert? He has no business being at the...oh. Ewww, that's disgusting. Oh, yes! I remember that! I used Sidney's new wheels to make a skateboard. Rad, right? That's what they say, isn't it? Oh, there I am! Notice that I've lost over 15 stone? Yeah, I divorced my wife! A pump? That must be for the Mayor and Sir Robert. It is a shame Sidney isn't an elephant. They're much more entertaining. The passengers are surprised their train hasn't arrived? Have you never used our railway before, sir? Who's idea of fun was..."
You get the idea with that. And then perhaps another one for lunch. A truly terrible episode. There's 10 minutes of my life I'll never get back. To think I "negotiated" early parole for this??? I was pleasantly surprised by this one. I didn't expect it to be bad, but I didn't particularly expect it to be this good. Sidney has a lot of charm (he actually does Dory's schtick better than Dory herself), the job he's given actually makes sense and it's a story that suits him really well. Yeah, Thomas felt a tad forced, but he had a really positive impact and everything else just worked. A very good start, and a great way to bounce back from a series that had a very lacklustre conclusion.